Even before the attempted murder of Sergei Skripal in the U.K., Russia had been accused of killing its critics on foreign soil more than once. WASHINGTON — If Russia was brazen enough to kill with a chemical weapon on British soil, could it happen in the United States? Heightened concern spurred by the poisoning of a former Russian spy in Salisbury, England, is prompting U.S. national security officials to consider seriously the prospect of a similar attack, current and former officials said. As the Trump administration punishes Moscow with more sanctions, the U.S. is taking a renewed look at how best to protect Russian defectors, dissidents and other émigrés, as well as how to respond if a military-grade nerve agent were ever deployed on American soil. So far, nothing of the sort has taken place, and even most Russia critics doubt that President Vladimir Putin would take such an extraordinary risk. Still, though Putin's government vehemently denies any involvement in the attempted murder of Sergei Skripal and his daughter, the U.S. has pointed the finger squarely at Russia, which has been accused of killing targets on foreign soil more than once. "If you think the Russians are trying to be good neighbors, this is the kind of thing they still do," Director of National Intelligence Dan Coats said in an interview this month with NBC News Chief Foreign Affairs Correspondent Andrea Mitchell. “Russians do bold things and extraordinary things." There are dozens of defectors from Russia and the former Soviet Union currently living in the U.S. who already enjoy protection by the CIA and are believed to be high on the Russian government's list of potential targets. The defector program has been active since the CIA's earliest days and was authorized by Congress. The CIA can bring up to 100 people into the U.S. per fiscal year under that program, although officials wouldn't say how many have actually been brought in. The U.S. intelligence community takes responsibility for their relocation and security needs, through the CIA's National Resettlement Operations Center. But that program is geared toward ex-government officials or intelligence assets who provide information to the U.S. intelligence community. It doesn't cover political dissidents, government critics and others who don't meet the definition of "defectors" but could still find themselves in danger in the U.S. because of their perceived risk to a foreign government. Former U.S. national security officials said the list of assumed Kremlin enemies in the U.S. is long, but that the government doesn't offer most of them any special protections. It's left to the FBI and other law enforcement and national security agencies to investigate specific threats as they emerge. The renewed look at dissidents' safety comes as Trump critics and Russia hawks argue that the president has emboldened Putin through his reluctance to challenge the Russian leader for his country's aggressive actions overseas. Asked earlier this year about Putin's authoritarian government, Trump said: "There are a lot of killers. You think our country's so innocent?" The killing of three Russian journalists late last month in the Central African Republic has further raised concerns about the safety of Russians overseas. The journalists were investigating a private security firm with reported Russian connections operating in Africa. The circumstances surrounding the ambush are still unclear. Yet in the Skripal case, the Trump administration did ultimately act. As NBC News first reported, this week it slapped sanctions on Moscow for violating international law by using a chemical weapon overseas. Those sanctions are designed to deter any additional attacks: They include a second round of penalties that kick in after three months if Russia doesn't make reliable assurances it won't use chemical weapons again and allow in international inspectors. "We once again reject in the strongest terms any accusations in the context of a possible involvement of the Russian state with what happened in Salisbury," Kremlin spokesman Dmitry Peskov said after the U.S. rolled out the sanctions Wednesday. U.S. officials said the difficulty in keeping potential targets safe increases when a public spotlight is cast on their situation, such as by a high-profile case like the Skripal poisonings. They also emphasized the need for better preparedness and training for the complicated emergency management and counterterror scenario that would play out if a chemical agent were ever deployed in a U.S. city as it was in Salisbury. The officials spoke on condition of anonymity to discuss security concerns. Skripal, a former Russian military officer convicted of spying for Britain, and his daughter were poisoned in March with the nerve agent Novichok, a Cold War-era creation of the former Soviet Union. The Trump administration joined the U.K. and other countries in blaming Moscow. 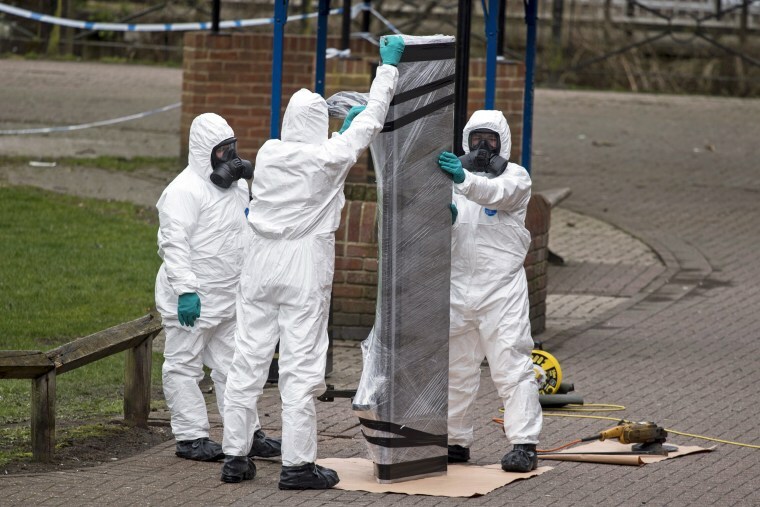 Two others in the U.K. were later exposed to the poison, including one who died, in an incident British authorities say they believe is linked to the Skripal attack. Asked about security concerns post-Salisbury, the FBI said it was working with federal, state and local law enforcement "to assess intelligence around any potential threats to public safety," adding that people should be aware of their surroundings and report suspicious activity. The CIA and the White House declined to comment. The Skipral poisoning, though shocking in its potential exposure of the public to a chemical agent, was far from the first time over the years that Russian government critics have been poisoned in Europe, and especially in the U.K. Among the more prominent cases is Alexander Litvinenko, another ex-spy and dissident who died in 2006 after drinking radioactive tea in London. Russian dissident Alexander Litvinenko in a London hospital bed shortly before his death in 2006. Vladimir Kara-Murza, a Russian opposition figure and democracy activist, has been poisoned twice — both times while in Russia, he said. Although he travels back and forth, he considers the U.S. the safest place for his family, given that there haven't been the kind of attacks in the U.S. that have occurred elsewhere. Yet the reminders of the risk are frequent. A few months ago, Kara-Murza said, Russian state television showed viewers his family's home address in the United States. "Generally, I hesitate to say I feel safe anywhere. We've known for a long time that opposing Putin is a dangerous vocation to engage in," Kara-Murza told NBC News. "But if there is a safe place on this earth, I think it is the United States." Russia argues that recurring allegations that its operatives are responsible for overseas assassinations are spurious and intended to provoke anti-Russian sentiment in the West. But U.S. spy agencies have long considered the threat to be well-founded. A CIA report on KGB methods compiled in 1964, not released publicly until 1993, said it had "long been known that the Soviet state security service (currently the KGB) resorts to abduction and murder to combat what are considered to be actual or potential threats to the Soviet regime." Difficult-to-trace poisons were a favored method, the report said. In 1987, then-CIA Director William Webster told a Senate hearing that defectors faced harassment from Soviet officials, both in the U.S. and against any family still back in the Soviet Union, intended to limit their movement, discourage them from helping the U.S. government, persuade them to "re-defect" back to the Soviet Union or recruit them as double agents. Webster told senators that the Soviets' "greatest interest is in those who can do them the most harm."